The multi band HF loop antenna, a good performer on 80 and 40-10 meters. 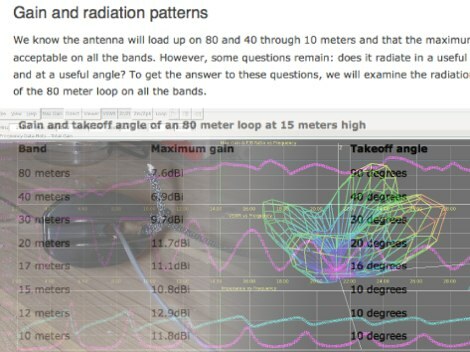 This excellent article covers all aspects of designing a resonant loop antenna, examining gain and radiation patterns, and describing practical notes on how to build this antenna. Here you will find many information on loop antennas. KA1FSB loop calculator give you a quick overview of the feasibility of "squeezing" a loop into your available yard or apartment space. The easy calculator yields a reasonable approximation of dimensions, to within 5% over the amateur bands, using typical wire gauges ranging from 12-18 AWG. Here is a successful 160 Meter short TX loop antenna 4 feet high, 3 feet wide, and 6 inches deep. 160 Meter short TX loop antenna - Here is a successful 160 Meter short TX loop antenna 4 feet high, 3 feet wide, and 6 inches deep. A Hanging Rectangular Loop Antenna - A rotatable hanging loop antenna that has been specifically designed for hanging in a tree. Horizontally polarized with a broad azimuth pattern and gain of nearly 3dB over a simple horizontal dipole! A Multi-band HF loop antenna - The multi band HF loop antenna, a good performer on 80 and 40-10 meters. This excellent article covers all aspects of designing a resonant loop antenna, examining gain and radiation patterns, and describing practical notes on how to build this antenna. 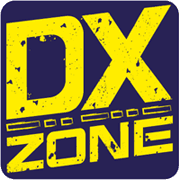 Horizontal Loop Antenna Experiments - The HF horizontal loop has been around for many years now. This article includes a YouTube video and discusses the reasons for looking at this antenna, its design, and its installation. There are some on-air comparisons against three regular double bazooka (coax) dipoles and the Par SWL End-Fed antenna. Loop Antenna info pop - Here you will find many information on loop antennas. Loop Antenna News and Information Forum - This is the Loop Antenna Group to Ask Your Questions, Get Answers and Information about Loop Antennas for improved your Radio Listening and Enjoyment. Loop Antennas and Calculator - KA1FSB loop calculator give you a quick overview of the feasibility of "squeezing" a loop into your available yard or apartment space. The easy calculator yields a reasonable approximation of dimensions, to within 5% over the amateur bands, using typical wire gauges ranging from 12-18 AWG. Multi-Band Super Mini Loop Antenna - Antenna covers all bands 80-10 meters + 30, 17, 12 meter WARC bands, need a lot that is at least 100 feet across. Skywire Loop Antenna - Also known as W0MHS Loop Skywire or Full Wave Loop Antenna, here you can find N1SU interesting observations on this antennas. The full-wave loop antenna - These omnidirectional antennas offer Horizontal polarization, and about 2.1 dbd of gain. They are much quieter than a dipole or a vertical, have a broader bandwidth and will usually out perform a dipole antenna. Vertical Full Wavelength Loop - Consider installing a stealth vertical loop antenna if you live in a place with no antenna restrictions. Full wave loop wire antennas allow you to be on the air without installing evidente external aerials. VK5ABN ALE Antenna - The VK5ABN loop antenna consists of a horizontal loop tuned to the 80M band and a dipole cut for the 30M band. W1TAG LF Receiving Loop - The loop is square, 6 feet on a side. Search only in "Loop Antenna"